This year I went to Japan and stayed one week in Tokyo. I took the Monorail every day because my hotel was in Tennozu Isle. I used to take the monorail to Hamamatsuchô, next station from Tennozu Isle and end of the line, and there change to Yamanote Line, the circular train line in Tokyo that takes you to almost any place. 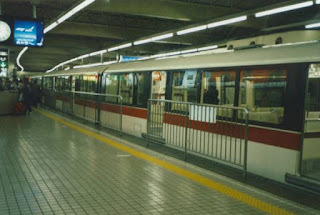 It is also the best connection between Tokyo and Haneda airport, much better than Narita with the N'ex or the Limousine Bus. 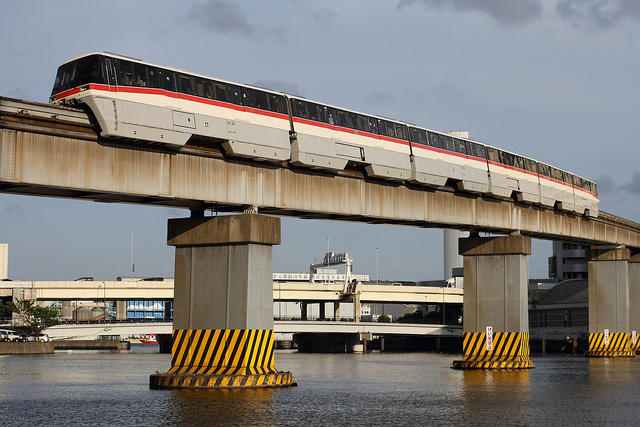 Also last year stayed in the same hotel (Dai-Ichi Hotel Seafort) and took the monorail daily. 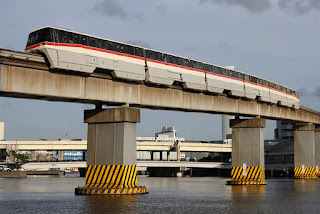 I really recommend you that hotel in Tokyo, it has incredible views, HUGE rooms and beds (in comparison to the rest of Japanese hotels...), the monorail station is inside the same building with lots of restaurants, convenience stores, pharmacy, and the monorail is free to catch with a Japan Rail Pass exactly as the rest of JR lines. I was in Popondetta, a railway shop in Akihabara, and sow the display model of the monorail in N scale. 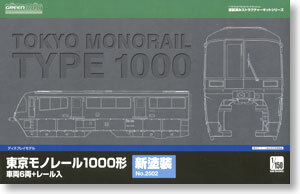 I had to buy it, as I like to collect all the trains I get on during my trips to Japan. It's just a static plastic model, there is no commercial model with motor, but anyway I'm in love with it and every time I see it all my memories from Tokyo come to my mind. My first idea was to motorize it and put it in my layout, but I realized that I would loose the interior details of one of the cars as the motor is impossible to completely hide. Other options like a hidden motor with wires to pull from it also seemed too much difficult for me. Apart from that, I didn't find a suitable place for it my layout, it would have been too anachronistic and out of its environment . So I took my own photos, searched some more on Internet and decided to make a diorama recreating the views I had from my room of it, with a certain level of freedom. I began with the bogies, thinking it would be an easy start. But I couldn't be more wrong. Each bogie has 24 pieces and most of them have to be glued. Some of them are so tiny that it is mandatory to use thin tweezers. There are 6 cars, 2 bogies per car... 288 pieces!!!! But bogies are functional and slide in a very smooth way though the beam. Then I continued with the seats, hopping not to to have more than one piece and having just to paint it.... error again!!!! The almost invisible seats come with no armrests which have to be glued and are even smaller than the smallest part of the bogies... AND THERE ARE A LOT OF SEATS!!!!! Instructions are not very prolific... enough to mount it but not for the painting schema. But taking a look to my own photos I painted them red, steel for the armrest supports and handles, and beige simulating the textile cases they have nowadays (the red you see in the photos is mistaken due to the tone the camera took). Next step was the skirts. I wanted a metallized look, but weathered with the mud they actually have. Illumination was a bit difficult for me. The standard led strips, those you can cut in groups of 3 led, don't fit the length of the cars, so I built my own strip, just one with the length of all the cars with all the led soldered on it. It's also a good way to keep all cars attached to each other. I attached the led strip to the interior roof with double sided tape before closing them with the floor and seats. I preferred to use sunny white led, like old lights. Wires run through a hole in the pillar. Also inside the car I glued some people, just cheap figures bought in ebay. May be 100 N scale people costs something like 10€ or less. Quality is awful, but inside the cars you can't see the details and it isn't worth to waste more money in good figures to put there. This warm light also adds contrast with the planned cold light of the street lamps. The diorama will have a road in the back, a wide side walk done with Evergreen textured sheet and small angles, and the water of the the canal as I was able to see every day in Tokyo from my room window. It was the first time for me simulating water, so following some tutorials, I painted the base in blue tones and added Vallejo Water Efects product. I thought it was possible to recreate calm water with it, but it's specially intended for brave waters and for calm waters there is another special product. Anyway, now I'm happy of the result and I would do it again in the same way, despite Tokyo bay water is normally calm. This is absolutely incredible! I would love to have a monorail on my layout. Well done, thank you for sharing! !